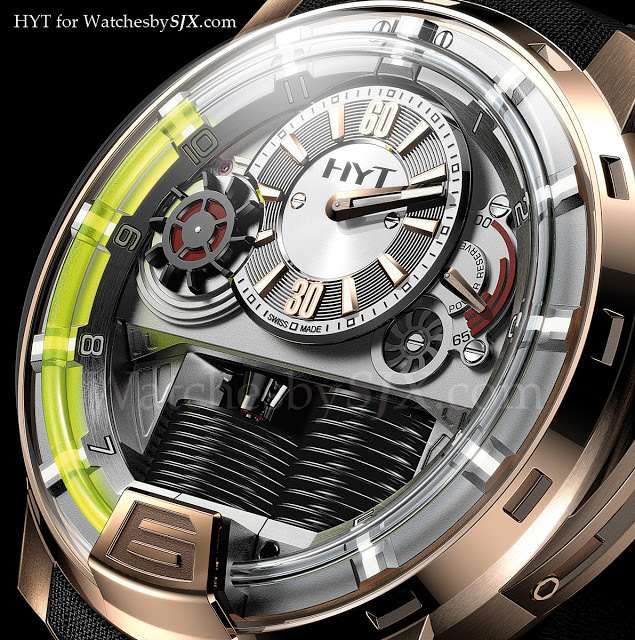 Here is a bit more information on the interesting hydro-mechanical HYT H1, seen here a few days ago. First the mechanics: the tube that displays the hours is actually filled with two immiscible liquids, one fluorescent green and the other clear. The meniscus separating the two is the hour indicator. Once the green liquid hits six o’clock, it quickly flows backwards and starts again , like a retrograde hand. Pressure on each of the liquids is exerted by a pair of flexible alloy bellows at six o’clock. Essentially this is a mechanical watch with a sealed off liquid display for the hours. 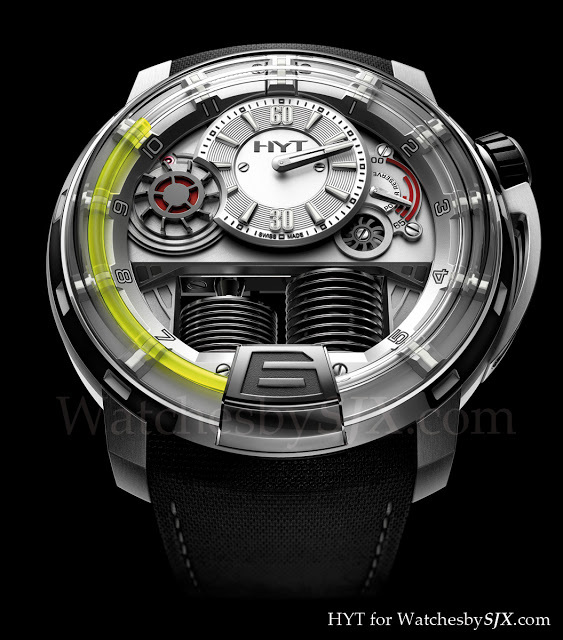 The H1 is manual wind with a power reserve of 65 hours. And the case is 48.8 mm in red gold or titanium. This idea was realised by Jean-Francois Mojon of Chronode, AP alumnus Bruno Moutarlier and Helbling Technik, a design consultancy. Vincent Perriard is the CEO of HYT. Mr Perriard used to run Concord, which once unveiled the Quantum Gravity C1, which has a liquid display for the power reserve. All in all an interesting idea, and if it works an achievement, but I wonder about its long term functioning.